We arrived to Lake Sakakawea at night after 1,700 miles of driving only to find severe thunderstorms plaguing the area. 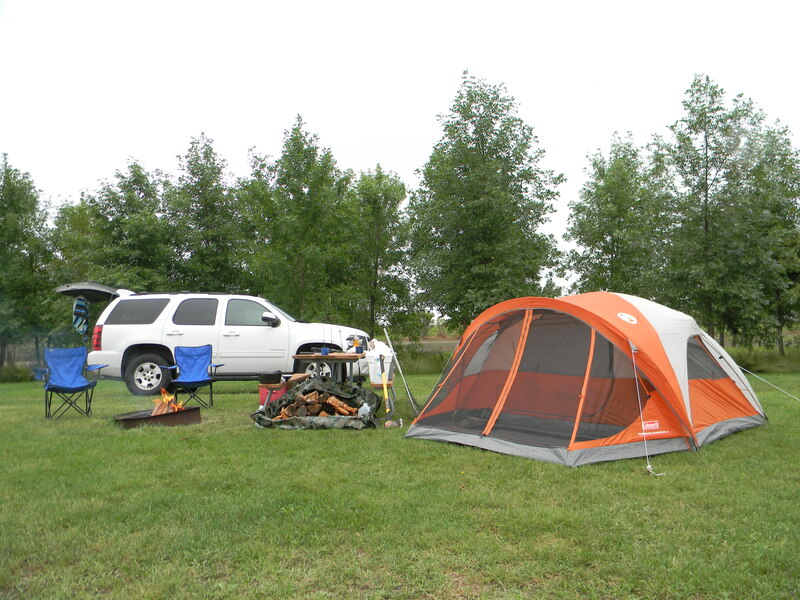 After a valiant attempt to set up camp in the 40 mile per hour wind, we postponed setup until the storms subsided. We waited patiently for a few hours until the storms ceased. It was now well into the night and the task at hand was to set up camp as quickly as possible so we could use the remainder of the night to fish ourselves to exhaustion and then sleep off the drive. Lake Sakakawea is located about sixty miles north of Bismarck, North Dakota and finds itself home to over 20 different types of game fish. The most highly sought after are Northern Pike and Walleye. Both fish are aggressive predators which cruise the lake in search of smaller fish such as perch and smallmouth bass. Local bait shops and sporting good stores in the area cater specifically to these game fish and can offer a great amount of assistance to someone who doesn’t completely understand the lay of the lake. Prior to arriving at the lake, we visited a local bait shop and got acquainted with the live bait rigs and the lures we would need to catch the fish in the region. 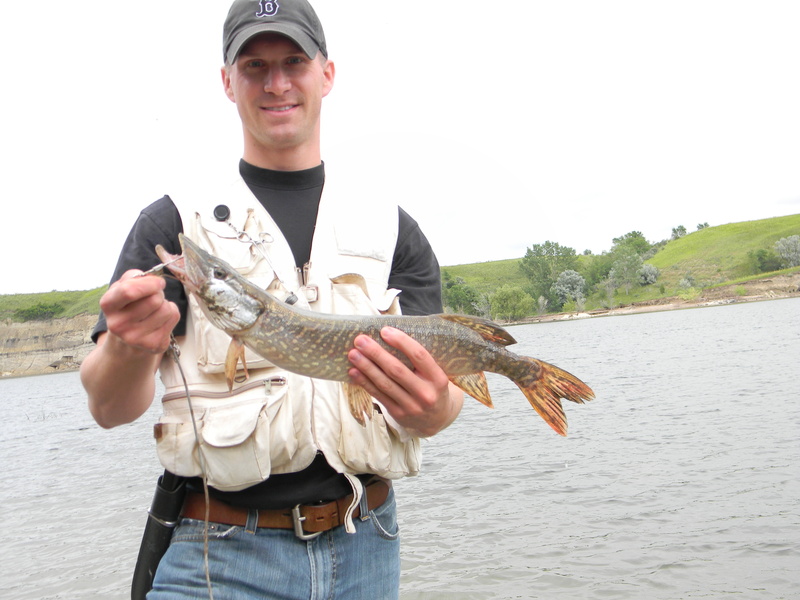 Suggested lures include rapala (stick bait) and crank bait which draw out the aggressive nature of pike and walleye. 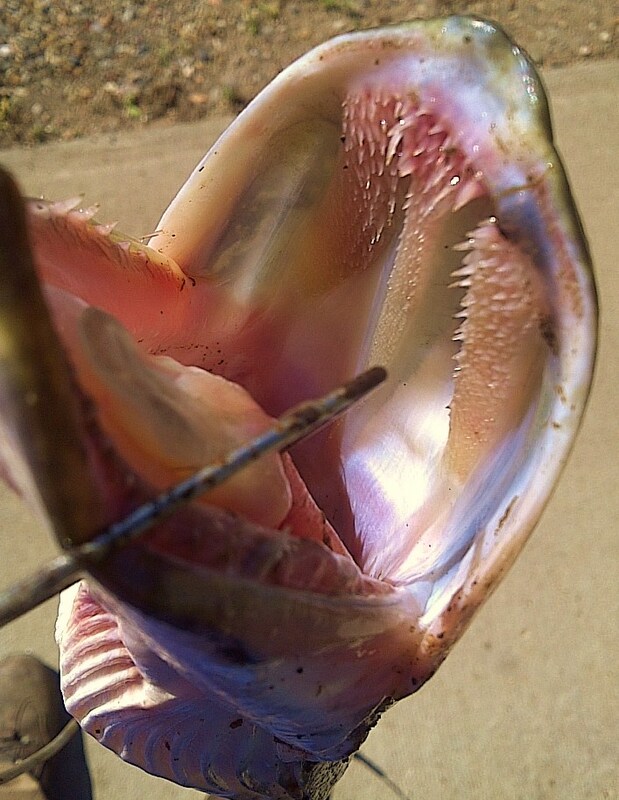 For live baits, the outfitter suggested leeches or night crawlers either on a sinking (with a bobber) or floating glowing jig head (off the bottom). Â The jig heads come in a variety of sizes and colors, each suited for specific strategies. 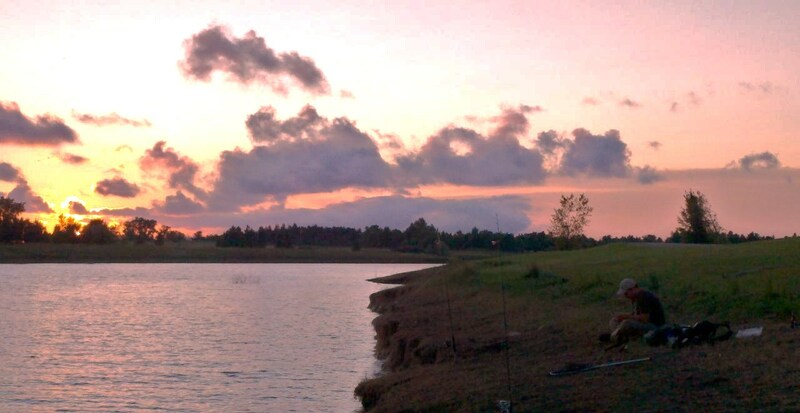 Under North Dakota fish and game regulations, each fisherman is allowed to have two fishing rods. We took full advantage of this regulation and used one pole off of the bottom with a glowing floating jig head and a night crawler. The other pole was used cast lures while we waited for something to hit the live bait. Once we were settled in camp around midnight, we set up directly across from our tent in an inlet with our backs to the wind. The sky was cloudy and the visibility low.Â The first fish was caught after about an hour. AJ reeled in a walleye out of theÂ seemingly empty lakeÂ on a black and silver rapala. This was the first North Dakota fish of the trip. Although AJ chose not to keep it, due to its size, the fish motivated us to continue fishing further into the night. After a half hour of not landing any fish, I decided to improvise on my rig. I added a bobber to the glowing floating jig head setup. Most fishermen in the country would be puzzled by this rig but determination had overtaken practicality as I searched for a way to top AJ’s catch. It proved to be successful within the first few minutes when I landed aÂ medium-sized catfish.Â In most areas of the U.S. catfish are frowned upon as a dirty fish, here in the NorthernÂ states, the water is cleaner so the catfish end up having a better flavor. Soon after rebaiting my line and flailing it back into the dark water I heard a splash and saw aÂ dim flash of silverÂ come out of the water and then diveÂ back in. I look up just in time toÂ see my fishing pole begin toÂ bend towards the water. I reel in a truly odd looking fish.Â At first, it appeared toÂ be a large freshwater shadÂ with its large silver scales and small pointed mouth. After some brief research, I discovered that it was a White Fish.Â White fish are not considered game fish in North Dakota but they are edible once you cut out the small bones within the fillet. Shortly after I returned my line to the water, I pulled in another decent sized White Fish measuring in at 14 inches.Â This was the last fish of the night asÂ exhaustion crept in and the night came to an end. The following day we awoke to improved conditions, the rain had slacked off and the weatherman predicted sunshine and warm temperatures. A short drive across the massive Garrison Dam took us toÂ anÂ areaÂ known asÂ Government Bay where the wind, which is mostly out of the north, was not so brutal. We situated ourselves next to a boat launch withinÂ theÂ secluded cove and went to work. Here we used the same methods as the night before with slightly improved results. AJ caught a nice sized Northern Pike usingÂ the same rapala lure.Â He also caught a smallmouth bass which was released back into the lake. I, unfortunately,Â did not have as much luck with the same setup from the night before, which has been dubbed by AJ as the “Justin Rig,”Â as its success proved only in my hands . IÂ did haveÂ two hits on my line, one almost dragging my pole into the water. After a few moments of fighting, the fish headed to the bottom and won as my line snapped at the hook with the fish not budging an inch further. The other hitÂ took my hook and left me with a frayed line. From there our attentions became focused on the catch of the day and some hot camp fire food. Despite the weather, it was still an amazing first day fishing the cold waters of North Dakota. Although we didn’t catch our limits, we were able to eat well off of the fish we caught. I have to say that Northern Pike is one of the tastiest freshwater fish I have eaten thus far. Check out the Recipe section to learn more about preparing the fresh fish over the camp fire.